Mark 51 Director. A simple, one-man instrument for 40 mm Bofors and also for 5-in guns at close-range targets. Take a motorcycle handlebar. Mount it on a box about 2 ft sq. Mount the box on a pedestal, and fix it so that the handle bars can move the box in bearing and elevation. Mount an optic sight in the box. Bend the handle bars so that the operator is comfortable holding the handle bars and looking through the sight. Add a gyro with its axis pointed mechanically along the line of sight of the optics. Apply electrical control circuits to the gyro so that when the operator is tracking a target in the optic sight, that the lagging deflection angle of the gyro, from the line of sight is measured electrically, in bearing and elevation. Run this information through a few more gadgets, and set a range input of 5,000 yards fixed. Add some synchro transmitters, to send this information to the 40 mm guns. Add a trigger switch to the left handle bar. This trigger is used to "cage" the gyro. When searching for a target you kept this trigger pulled or closed. This kept the gyro caged. Caged means that the gyro was mechanically held, so that its axis was parallel to the line of sight of the optics of the Mark 51 sight. The Mark 51 sight by the way was called the Mark 14 gun sight. After you got the target centered in the sight and you were smoothly following the target you released the caging trigger. Only then would the gyro lag your line of sight, which allowed the computer, if you will, to produce the necessary information to sent to the gun mount, to properly lead the lead the target. If at any time you felt that the lead angle had been disrupted, maybe you jerked the director, you pulled the caging trigger, held it a couple of seconds, then released it. The process starts instantly, to solve the FC problem, when you uncage the gyro. Add a firing trigger to the right hand handle bar. When the operator has the target in the cross hairs, he pulls the firing trigger. If the pointer, trainer, and gun captain all have their firing triggers pulled, the 40 mm gun mount will commence firing. The director operator watches the target and the trail of the tracers to see which direction he needs to move the director, for the shells to hit it. Remember range is fixed, so this is how he corrects this. The director was changed so the range to target was inputted to the batch of gadgets, to solve the fire control problem an produce an electrical signal to the gun mount. This new director with the radar was then designated the Mark 57. The operator still had to see the target visually, in order to track the target so it was not a blind sight system. The operator still watched the tracer fire and moved the director accordingly, in order to hit the target. The 40 mm mount was an excellent AA fire weapon. Had about 10,000 yards Max range, more or less, horizontal, about 6,000 straight up. Firing about 120 rounds per minute. Single, twin, or quad mounts. Up to 6 mounts., as I recall, could be controlled by one director. Although if you had more you could control them. Generally speaking, there would be a Mark 51 for each 40 mm twin or quad mount. In pictures, these are the small, boxy looking things mounted close to those mounts. Single mounts were usually hand-worked. One hell of a lot of flack. Pretty simple system. Very effective. All of the projectiles were set to explode at about 5 or 6K yards. This brings to mind of about the only problem this system had which was the optic sight. It was almost impossible to keep moisture out of these sights. So the FC's spent much time drying silica jell and putting it in the sights to try to defog the mirrors and optics. The Mark 51 was primarily intended for the 40 mm Bofors. As the 40 mm gun was replaced by the 3"/50, the 40 mm's disappeared. An Ordalt was performed on the Mark 51 and Mark 57 to correct for the ballistics of the 3"/50's. When firing the 40 mm gun you had tracers to watch in the Mark 51 sight, so this showed the operator where his rounds were going with relation to the intended target, this allowed you to lead or lag the target with the sight in order to hit the target. The 3"/50's did not have tracers, so they were harder to tell what you were doing, with respect to the target. The 3"/50 primarily used VT fuse. There was an alternate point contact fuse, which nobody used. Since the 3"/50's were mounts to replace the 40 mm's, there was no barbette under them, so mechanical timed fuses were out. Whatever ballistics the Mark 51 was built for is what you had to operate with. If you had 40 mm's that was the ballistics. So if you connected a 5"/38 to the MK51 the ballistics were wrong. Not to worry, you used the Mark 51 sight to correct for this by leading or lagging the target. You could have 40 mm's and 5"/38's connected to the same Mark 51 director at the same time and fire both, if you wanted to. Or any other configuration you had. The same is true with all other FC directors on board. The Mark 37 FC director transmitted its position and range information by synchro. 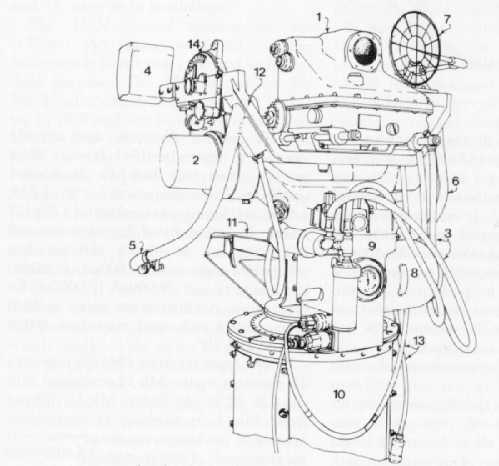 The Mark 1, Mark 1A and Mark 8 rangekeeper, all used synchros to receive their input data, bearing, elevation, range, true north, ships heading, etc. All output data was transmitted by synchro. These computers used mechanical rate integrators, which integrated time against bearing, elevation, and range changes, to predict the future position of the target, to position of the guns for firing. The Mark 51/56/57/63 directors transmitted their bearing and elevation position by synchros. But all of these systems used a rate deviation gyro which lagged the line of sight to the target. The output of this lag was two electrical signals, one representing elevation and the other bearing. This electrical lag info was received by the computers of the respective FC computers, and combined with the synchro information of the FC director position in elevation, and bearing, to determine the rate at which the target was changing bearing and elevation position. The product of this combined information was then used as the prediction of the future position of the target so was used to position the guns for firing. What all of the above means is that the computers the Mark 51/56/57/63 directors used could not be connected to a Mark 37 director because the rate gyro input was not available from a Mark 37 director, so these computers could not make future target predictions, if they were connected to a Mark 37 director. So this would not be a workable system. For the same reasons a Mark 1, Mark 1A and Mark 8 rangekeeper, could not be connected to a Mark 51/56/57/63 FC director. At just about the close of the war, a new director, the Mark 57 GFCS, was introduced which was used to augment the Mark 51. These were similar to the Mark 51 but they now included a Mark 34 radar, radar scope and a Mark 17 computer. This new FCS gave accurate ranging and added a radar operator to the system. These systems gave blind-fire capability to the 40 mm mounts. There were about one Mark 57 added for every four Mark 51 directors. The Mark 57 was manually operated with a set of handle bars with triggers similar to the Mark 51. The operator could track the target either with the optical gun sight or on the radar scope. The computer, using two rate-of-turn gyros and a cross-roll gyro, transmitted target data to the computer below deck which then calculted the target problem and sent the gun train and elevation data to the mount or mounts under control.